3.00PM Onsite Adin Street Supermarket / Proposed bottle shop / parking and road closure for Scotts Head Food and Wine Festival. 4.30PM Council Administration Centre - (Horticulture) Planning Proposal and DCP amendments. That Council make urgent representations to its State and Federal Members and the Rural Doctors’ Network and seek a meeting of local GP practices’ to discuss and identify the opportunities and impediments to securing a GP for Bowraville. Council will be aware from recent media reports that Bowraville and its surrounding community recently lost its sole resident General Practitioner (GP). The surgery also provided rooms and facilities for visiting psychology, physiotherapy and pathology services which may now also cease. The loss of the GP surgery will have broader economic implications for the chemist in High Street and other Bowraville businesses as locals regularly use other services when visiting town for a doctor’s appointment. Concern has been expressed that a number of allied health services provided in Bowraville will no longer be accessible as they require a GP referral. The availability of a GP in Bowraville is essential for community wellbeing. Council received an email invitation to apply for last minute funding on Friday, 6 April 2018, closing at 8pm on Monday 9 April 2018, for the Tourism Demand Driver Infrastructure (TDDI) Program. The invitation was labelled as a “rapid limited Local Government Round application”. After consultation with the General Manager, Manager Assets, Manager Infrastructure Services and Coordinator Strategic Planning & Natural Resources, an alternative position for an RV/caravan dump point was proposed, beside the parking area identified in the adopted Dawkins Park, Macksville Landscape Enhancement Concept Design – dated 21 June 2016. This potential overnight “free camping” location is directly off the highway and beside the Caltex Service Station. It will not impede on traffic in and out of the Aquatic Centre or for those people collecting and dropping off for bus services. It was agreed that this project would suit the guidelines for this program. The project that is the subject of our application is for establishment of this parking area, installation of a dump point, landscaping, lighting and signage. Under this rapid program, the works are to be completed by 30 June 2018. It is also worth noting that the Concept Master Plan for the Macksville Memorial Aquatic Centre included a reconfiguration of the car parking area and it was not deemed practicable to include a dump point in this car park. That Council note the lodgement of a funding application for more recreational vehicle and car/caravan parking (incorporating a dump point) as a part of the Dawkins Park redevelopment in lieu of the Macksville Memorial Aquatic Centre car park. Not approve this alternative dump point and parking location for RV’s and caravans visiting Macksville. The turnaround time for the grant application for funding under the Tourism Demand Driver Infrastructure (TDDI) Program - a “rapid limited Local Government Round” was only 2 business days, so discussions were held with internal staff to determine their ideas, and suggestions, regarding a suitable application. In turn an alternative location for a dump point that wouldn’t impact on Council’s sporting infrastructure, and be a more suitable, accessible and hygienic location for residents and visitors alike was identified. 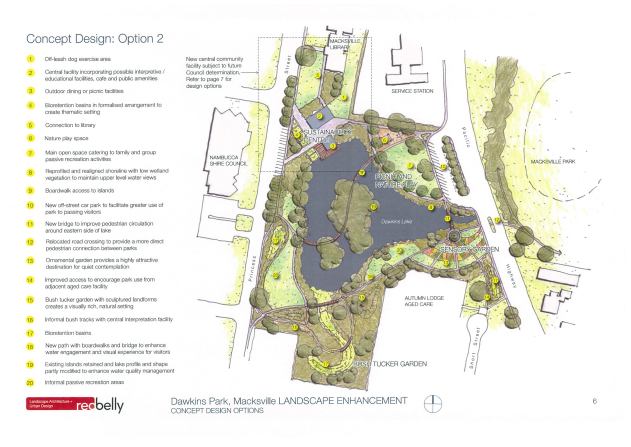 Council has adopted the Dawkins Park Macksville Landscape Enhancement Concept Design Options report prepared by Red Belly Landscape Architecture & Urban Design, dated 21 June 2016. Concept Design: Option 2 identified a new off-street car park to facilitate greater use of the park by passing visitors. This Concept Plan has involved extensive community consultation and the addition of the dump point would facilitate use by people travelling in Recreational Vehicles and caravans. It provides easy access for them to explore Macksville, the park and utilise local businesses and facilities. The alternative position for the dump point, and RV parking wouldn’t impede the flow of traffic through the Aquatic Centre’s car park, and RV’s would not take up extra parking spaces that could be used by other visitors to the town, users of the Aquatic Centre, or people accessing bus services. The alternative dump point position would, however, require works to extend the sewer from a manhole point at the northern end of Short Street, Macksville. This work would be required in the future to facilitate the construction of public amenities noted on Concept Design: Option 2 - #2. With the assistance of grant funding under the TDDI program, we could conduct these works this financial year, moving us closer to completion of the Dawkins Park Enhancement project. There is a need to provide overnight rest areas based on demand. The Council has the opportunity to proactively manage this demand to achieve the best economic outcome whilst avoiding the conflicts associated with poorly located “free camping”. A Concept Master Plan for an upgrade of the Macksville Memorial Aquatic Centre, adopted by Council 22 February 2018, shows a reconfiguration of the car park to include an additional nine (9) car parking spaces. The flow through of traffic could be considerably impeded with the inclusion of RV parking spaces and installation of a dump point in the Aquatic Centre car park. It could create congestion and provide concerns when major events are held. 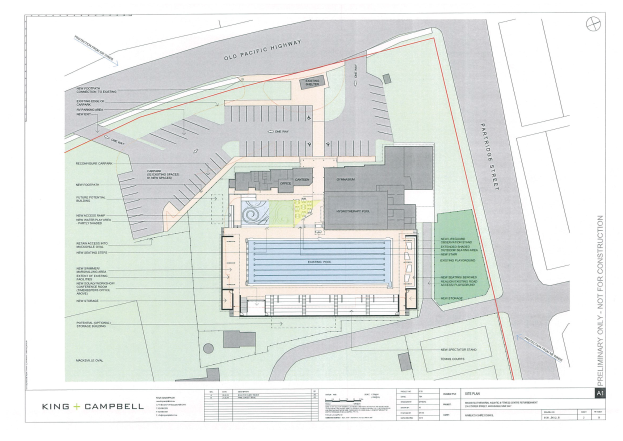 This Concept Master Plan, as adopted, will also be submitted with Council’s application under the Regional Sports Infrastructure Fund for an upgrade of the Macksville Memorial Aquatic Centre. Impact on the environment will be similar to the previously suggested site in the Macksville Memorial Aquatic Centre car park, however it could be considered a more hygienically suitable location. This alternative site for the dump point and RV/caravan parking could be considered more socially acceptable as it will not impede access to our sporting precinct and parking for users of these facilities. Council, if successful with our application under the TDDI Program, is required to match funding. The project has been estimated at $270,600, so Council’s co-contribution would be $135,300. There is money available in the budget for Dawkins Park enhancement this financial year, and some of this could be used towards the project, as it is identified on the Concept Plan, and the balance sourced from Council’s working funds. Minimal risk to Council to consider this alternative site for RV/caravan parking and installation of a dump point. Council would need to make a co-contribution of $135,300. There is money available in the budget for Dawkins Park enhancement this financial year, and some of this could be used towards the project, as it is identified on the Concept Plan, and the balance sourced from Council’s working funds. If Council receives this grant funding a design for the construction of the car park and the provision of the dump point will need to be prepared as a matter of urgency. That Council replace the community infrastructure item, “Pathways and place-making in Macksville around Dawkins Park area – estimated cost $100,000” with “Revitalisation and Improvement Program – Local Main Streets – estimated cost $100,000”. The allocation of the funding from Round 2 of the Stronger Country Communities is a matter for Council. The projects have to meet the funding criteria but otherwise the $1.6m which will be made available to Council is not contestable. In early February 2018 the Council submitted an application for $2m in funding ($667,000 per year for three years) under the State Government’s Growing Local Economies Grant Program for the purpose of revitalising and improving local main streets in the CBD’s of Nambucca Heads, Macksville and Bowraville. The grant application, if successful, would provide the necessary financial support for the work being undertaken by the Council’s Business Advisory Committee. At the time the EOI was discussed with representatives of the Department of Premier and Cabinet who were generally enthusiastic about the potential economic and social benefits which could be achieved via a Main Street type program. I have now received some feedback from a reliable source that notwithstanding previous enthusiasm, Council’s application will likely “struggle” to achieve funding under the Growing Local Economies Program and that instead the Council should consider including it as part of the Round 2 Stronger Country Communities funding which is reported elsewhere in the business paper (item 9.9). Whilst it is not proposed to withdraw the application for $2m under the Growing Local Economies program, it would be prudent for Council to look at “covering its bets”. By way of suggestion it is proposed that the $100,000 earmarked for pathways and place making around Dawkins Park in Macksville be instead allocated to the proposed CBD main street program. The reason for this is that considerable momentum has been generated by Council’s Business Advisory Committee in the main street program and it is timely to realise whatever opportunities may exist to improve the CBD’s post by-pass. The $30,000 funding provided by Council for the preparation of concept plans for verandah reinstatements and the like has provoked significant interest from property owners in Macksville and with some further funding and time it will be established whether or not property owners will commit to investing in the opportunities to improve their properties and their CBD. Another reason for the proposed change in funding allocation is that Council already has funding earmarked for Dawkins Park and other opportunities for grant funding for the park are currently being pursued. The General Manager has received feedback from a reliable source in relation to an application for $2m submitted under the Growing Local Economies Grant Program for the purpose of revitalising and improving local main streets in the CBD’s of Nambucca Heads, Macksville and Bowraville. The matter has been discussed with the Grants Officer. The work of Council’s Business Advisory Committee is engaging many property owners in the Macksville CBD who expressed interest in improving their buildings and the presentation of the CBD. There is considerable interest in the work which local architect Alan Rudge is undertaking via $30,000 in funding provided by Council. The potential economic return from a Main Street improvement program which brings together government and private sector funding could be significant. The economic benefits of similar programs have been demonstrated in country towns across Australia. In particular the Macksville CBD has a huge potential to be a more attractive and prosperous river town post. The economics is simple. More appealing places attract more people and more people for longer periods, increasing turnover and in turn property values, which in turn provide even greater capacity for investment. It is a positive investment cycle. There is a risk that property owners will not see the potential for enhanced property values and not commit to investment. If this is the case then the $100,000 funding identified in this report may be sufficient to assist those property owners who do identify an opportunity. The staffing resources required to support a main street improvement program and the Business Advisory Committee are limited. Existing resources could probably maintain an incremental take up of projects but may struggle if multiple projects are undertaken at the same time. This report is to facilitate an additional waste waiver application from E J Biffin Fields Committee of Management (CoM) for Council’s Donations Program 2018/2019 and should be considered in conjunction with Item 10.2 Donations Program (Section 356) 2018/2019 Applications for Waste Services. Due to technical issues with emails, E J Biffin Fields CoM submitted their application late, on 7 April 2018, for additional waste services in the 2018/2019 year, and were advised, pending receipt of the application, it would be considered with the other applications at Council’s meeting on 12 April 2018. That Council approves the application for provision of additional waste services for one-off events/regular events for E J Biffin Fields Committee of Management. That Council can choose to reject, approve or not approve the above recommendation. There are positive social benefits associated with the donation of additional waste services and waste waivers to various community groups throughout the Nambucca Shire. There are positive economic impacts for the charitable organisations. As a comparison, 99.92 tonnes of waste, from charity organisations, was deposited at Council’s waste depot in the 2016/2017 year.